The Microsoft Lumia 535 packs a 5.0" IPS display of qHD resolution (540 x 960 pixels). The pixel density of 220ppi provides acceptable sharpness and the image quality is surprisingly good. Colors are nice and punchy and viewing angles are quite decent too. There's little color and contrast loss even if you look at it at an extreme angle. 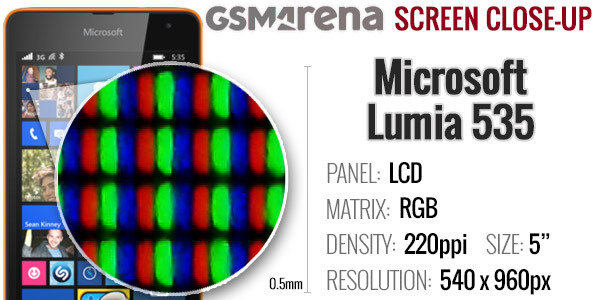 Here's a microscopic image of the screen's RGB matrix - it does come with a standard pixel arrangement. Although we found the blacks and pixel density of the Lumia 535 to be only average we should note that the contrast is very good, particularly for this price range. Unfortunately the smartphone did poorly in our sunlight legibility test, the screen is very reflective and almost unusable outdoors in a bright sunny day. We notice the touch input is not as accurate as on other Lumia smartphones. We occasionally ran into issues with the touchscreen - from activating the adjacent option instead on the one we pressed on to not detecting the fingertip at all. It isn't that annoying as it sounds, but it is still something to consider as a drawback. The Microsoft Lumia 535 is powered by a 1,905mAh battery. According to the official stats it should be enough for about half a day of calls in a 3G network and two weeks of stand-by. Of course, we ran our own battery test and the results are in. 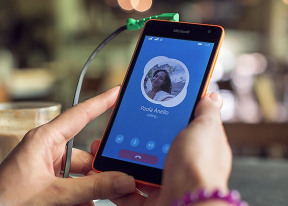 The Lumia 535 Dual SIM is indeed capable of lasting half a day on a call. Its browser and video playback endurance however is quite poor, while the standby performance is only average. 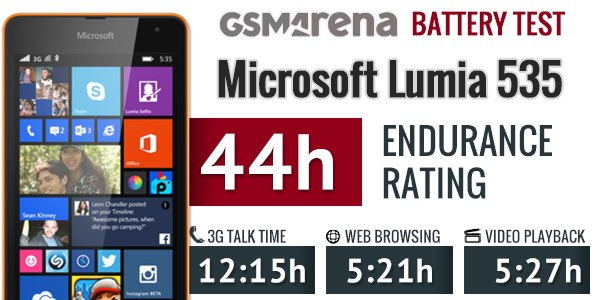 The Microsoft Lumia 535 posted an overall 44 hour endurance rating, meaning you can use the smartphone for about two days days if you do an hour each of calling, web browsing, and watching videos daily. It is far from impressive, even for a dual-SIM smartphone. The Microsoft Lumia 535 is available in both single SIM and dual SIM versions. Both models support quad-band GSM and dual-band 3G networks. The SIM card slots are of the micro-SIM variety, while none of the models offer SIM card hot-swapping. If you opt for the dual-SIM Lumia 535, you'll get two microSIM beds with dual stand-by functionality. Of course, once you're in a call on one of the cards, the other SIM becomes inactive. The rest of the connectivity features available across all models include single-band Wi-Fi b/g/n, Bluetooth 4.0, GPS with GLONASS, and an FM radio with RDS. There is a microUSB 2.0 port for charging and data connections. Mass storage mode is supported for access to the phone's built-in memory and microSD card. There is no TV-out functionality whatsoever - wired, or wireless. Also currently, there are no Windows Phones that support USB On-the-go, so that's missing, too.